Smart Move In Locking That One Down, Josh. Through no fault of our own, an insipid bit of pop culture minutiae has bored its way into our brain like those nasty little brain-eating creatures in Star Trek II: The Wrath of Khan. 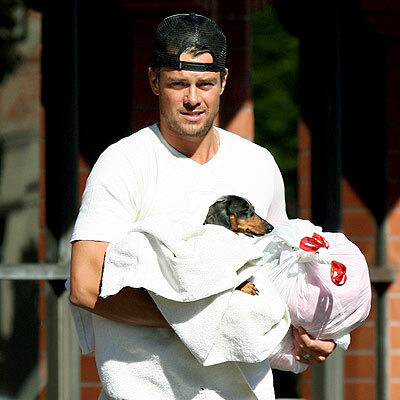 Recently, Promethean Times became aware of the existence of actor Josh Duhamel after the actor made the news for his boorish behavior. The hitherto-unknown-to-us actor is alleged to have delayed a La Guardia flight bound for Kentucky when he had to be removed after churlishly refusing an attendant’s several requests to shut down his Blackberry prior to takeoff. Pop Culture Enters Your Brain In Much The Same Way. We inadvertently stumbled across this story while looking for actual news, and since the headline didn’t indicate who the actor was, we were duped into thinking it might have been someone of note. We could not have foreseen that not only would our assessment be incorrect, but that we would be subjected to the forced absorption of useless and meritless trivia. We were no worse off for our previous ignorance of Duhamel, and are certainly no richer now for the knowledge. Yeah, That's Kinda How We Feel, Too. We Were Fine Not Knowing You Existed. We learned that Duhamel–whom we have trouble not thinking of as ‘Douche Juhamel,’–is married to Fergie, by whom we mean Stacy Ferguson, lead skank of Hip-Hop juggernauts The Black Eyed Peas, and not Duchess of York Sarah Ferguson, ex-British Royal turned Weight Watchers spokesperson turned embarrassing would-be access peddler. Moreover, we were treated to the information that the soulful slattern likes her men well-hung, and that Duhamel is deserving of inclusion among that select group. Fergie Is REALLY Into Meat-Missiles. And There's Nothing Wrong With That. There is such a thing as too much knowledge, especially if that knowledge is inconsequential. Most upsetting is the idea that in becoming aware of Duhamel, we may have forgotten something which really mattered. Don't Judge. It's Just That A Man Grows Weary Of Fergie After A While. It is our hope, then, that some of you reading this may also have been hitherto unaware of Douche Juhamel’s existence. We are pleased to share with you in this small, intimate way our pain. Really, you don’t know who he is? The guy was in Transformers 1 and 2. One of the biggest movies of all time. Thank God Zoe Saldana didn’t get in the news for an outburst either. Then I’d have to read about how you didn’t know who she was either. Another swing and a miss for this website. Step your game up. Thanks for the feedback, Patrick! It sounds cliche, but we created PT for the fans, and it’s great to feel the love. And make no mistake, when a lonely voice from the depths of the internet challenges us to step up our game, we do just that. Patrick, have no fear. I’m putting Smaktakula on it immediately. It’s good to see that you have refused to take this criticism lying down. Promethean Times are three of my favorite blogs, and I expect no less from it. The feeling is mutual. Anyone clever–and daring!–enough to pull off an antecedal triple-flip deserves our respect as well. So you’re just making up words now? Folks, if you’re concerned that you only understand about 50% of the things Smaktakula is saying, it might help you to know that he’s hovering around 75% comprehension himself.